Microsoft OneNote is a useful application for taking notes, organizing information, and accessing them at any time, from any location. Microsoft OneNote comes as part of the Microsoft office 2010 Suite, but not many of us are aware of the potential of the app. In this tutorial, I’ll introduce you to OneNote and show you how you can organize data with Microsoft OneNote so that you can make the best use of a resource for which you have paid. OneNote is a central place to store your notes (you can type them out or handwrite them), web pages, videos, images, audio files and more. The interface gives the appearance of a notebook with loosely bound pages. There are three OneNote terms you should be familiar with. 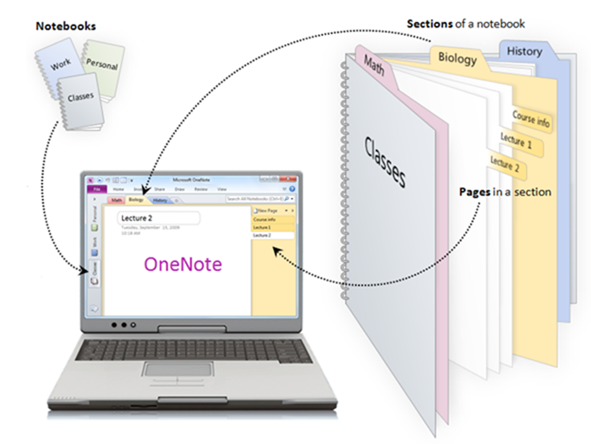 Notebooks: This is a single OneNote file that pertains to a specific topic. It contains several pages. For instance, you can have a notebook called Recipes which will hold various recipes. 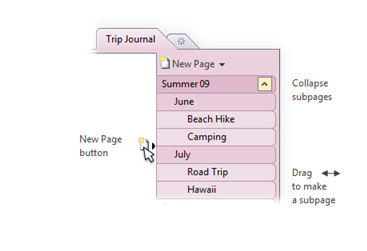 Sections: Within each OneNote file, there are tabs that allow you to group information as sections. For example, you can have vegetarian recipes or appetizers as a section in a Recipes notebook. Pages: Each section contains pages. So in a Recipes notebook, you can have a section called vegetarian recipes and within that section, you can have several pages featuring vegetarian recipes. OneNote has cool features that make organizing your data super simple. * OneNote works very easily with other Microsoft products such as Internet Explorer, Word, or PowerPoint. To send information from such applications to OneNote, all you need to do is use the right-click context menu. 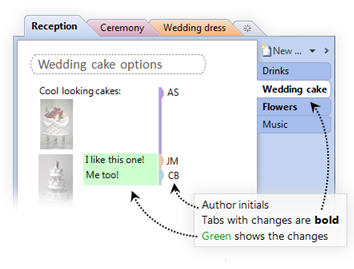 Most of the common tasks in OneNote can be accessed using the right-click context menu. * You can move important email messages, tasks, events or contact information from Microsoft Outlook to any notebook by using the OneNote command that’s integrated into Outlook. In just a couple of clicks you can transfer email contents to your notebook. Similarly, you can link you meeting notes with Outlook. *You can create links to pages with a notebook or other notebooks, embed links to other Office files, import content, and save content from the web along with the links to the site for reference at a later stage. *You can create multi level subpages and organize them topics using indents. * You can collaborate with others by collecting comments from other users on a notebook page. OneNote also automatically highlights changes made to a page that multiple authors are working on. * Tagging items makes them easier to find. OneNote makes use of tagging to help you stay more organized. * Password protect your notebook if you have private and confidential information that you don’t want others to access. * If you have a Tablet PC, OneNote is a dream app to use. OneNote includes touch support so you can pinch, swipe, and use other gestures to work your way around OneNote on mobile devices. * You can create tables, write anywhere on a page, add mathematical equations, translate your notebook contents, record audio notes and more all in a few mouse clicks. There’s no limit to what you can do . * Sync OneNote to the cloud and access your notes, anytime, anywhere with the OneNote Web App on your mobile device or using Windows Live SkyDrive. *Enter your thoughts quickly from the taskbar using the New Side Note feature that pops up in the taskbar. Microsoft OneNote is a super simple app that lets you create and organize notebooks for each individual project. Have you used OneNote to plan and organize your tasks? If your answer is No, then its time to give it a try. This is a good Microsoft application, I never knew about this before until I have read this great review.once this is installed in our computer there shouldn’t be a problem. because we can organized our date and compile it, which is better to locate. OneNote is a MS Application that is oftentimes ignored as it is pre-installed in Windows PC. But it is actually very useful in so many things. One of which is what you just shared about data organization. Great review! One note is a great program. I have had a lot of use out of it. Really helps out around the office.